This week we’re bring home loads of corn from the farm stand and picking tomatoes like it’s our job! This is our absolute favorite time of year for eating fresh veggies and can I say that I don’t want August to end because of this? How are you guys taking advantage of summer tomatoes these days?? 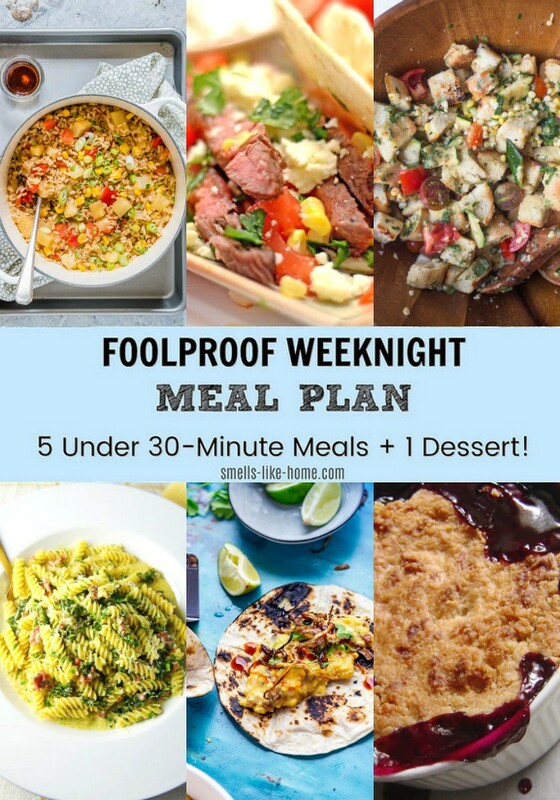 My entire Foolproof Weeknight Meal Plan series can be found here! 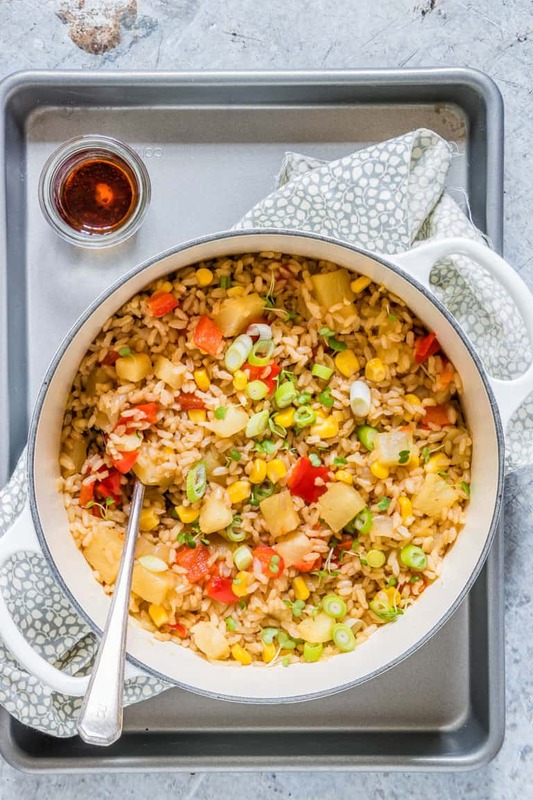 Pineapple Fried Rice by Recipes from a Pantry: What is it about fried rice that is always so comforting? It’s like a meal in a bowl that just wants to make you snuggle up with a blanket and binge on Netflix. No? Just me? Well anyway, this quicker than quick dinner is vegan and gluten-free but if you’ve got a meat-eater to feed or you don’t follow any type of eating preference, mix in 2 beaten eggs (traditional in fried rice!) and some shredded chicken to round out the meal. Note: You want to use COLD, cooked rice to make fried rice so take a few minutes on the weekend to make your rice so it’s ready to stir fry up this delicious meal on Monday! White rice will take about 20 minutes to cook; brown rice will take around 40. Grilled steak tacos by Platter Talk: Let’s not allow this week go by without an insane steak taco recipe, shall we? 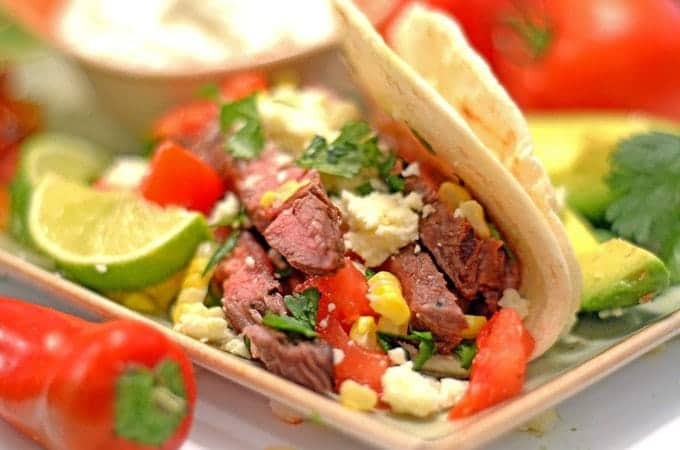 I ADORE a good steak and when you stuff it inside a taco, you’d better make sure you’re making extra because I’m gonna want seconds, especially when you’re covering them with queso fresco. Just sayin’! 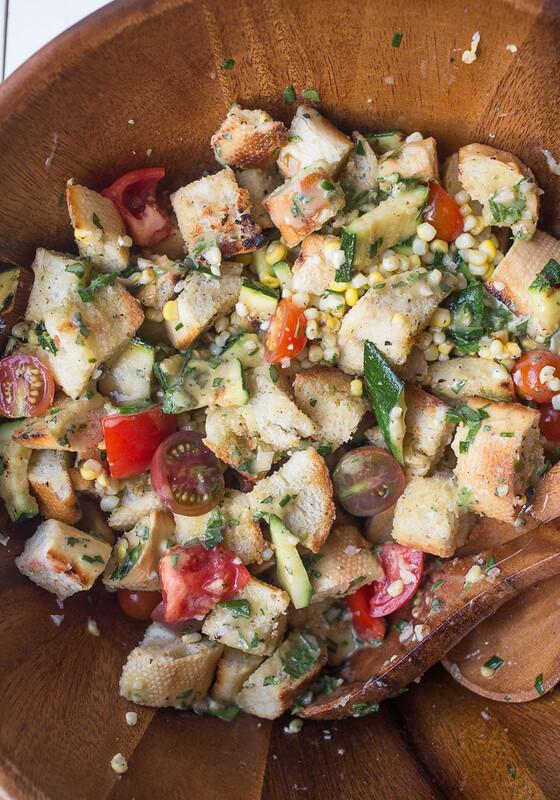 Grilled sweet corn and zucchini panzanella salad by Smells Like Home (hi!! ): YOU GUYS. This salad is the best thing to hit my lips in the past 2 summers! For this salad, everything except the fresh herb vinaigrette and tomatoes is grilled and I’m going to guarantee that you’re gonna fall madly in love with every single part of this perfect summer meal. Go ahead and try not to! Rotini with chorizo and creamy kale sauce by Orgasmik Cooking: You had me a creamy kale sauce. I mean, how delicious does that sound?? And when chorizo and pasta are added to the mix, I’m willing to bet that you’ll have a hard time turning this down too! 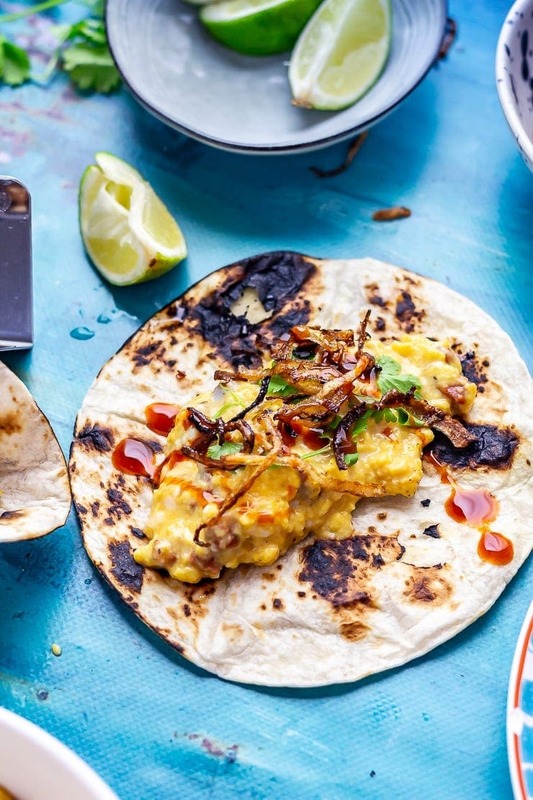 Chorizo and egg breakfast tacos by The Cook Report: Another taco recipe this week? Oh heck yes!!! We are BIG breakfast for dinner fans and when you mention the word chorizo, you can bet we’ll be making the recipe. How insanely delicious do these breakfast tacos look with those crispy fried onions and hot sauce drizzles?! 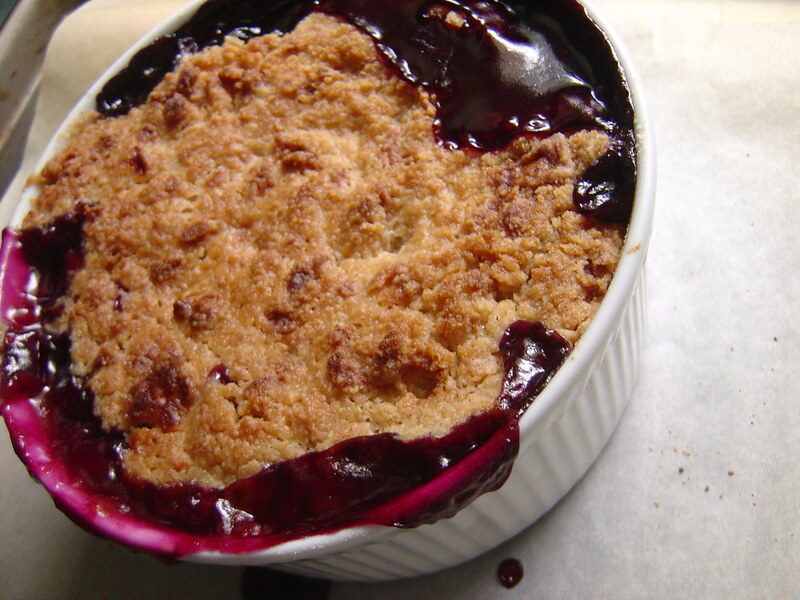 Peach and blueberry crumble by Smells Like Home: You guys! This crumble is summer baking at its very best! Overflowing with juicy, ripe peaches and blueberries up the wazoo, this crumble is one of the most amazing desserts I’ve ever made.